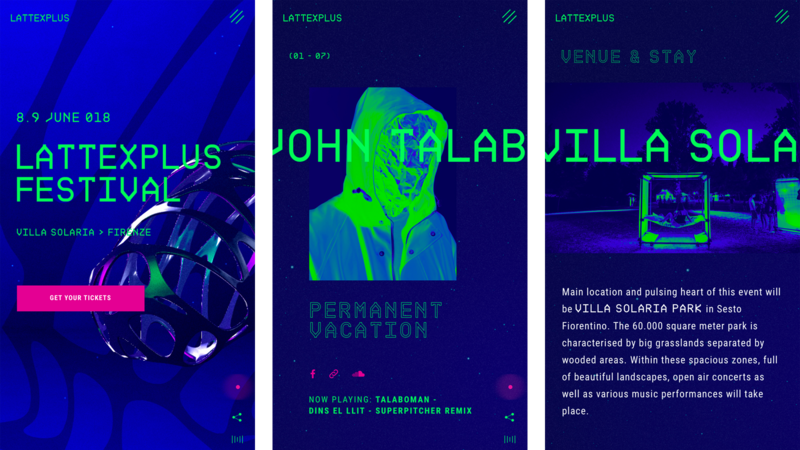 For the second year in a row we had the pleasure of designing the website for LattexPlus Festival, a famous electronic music event in Florence. Working with the guys from Lattex always gives us the creative freedom of experimenting with new and cool techniques. The two days event spans between day and night and we designed the website having this concept in mind. The experience can be lived in two modes depending on the time of the day you visit the website and the user can also switch between them by clicking on the moon/sun icon in the footer. Every visual element, from the user interface, to the photos and 3D models change their look based on the version of the site the user is navigating. The result is a clean and smooth website where the user can easily discover the festival lineup and other useful info while enjoying a simple but attractive experience.